Halmoni Yong-Soo Lee, center, flanked by San Francisco Supervisors Eric Mar and Jane Kim, with supporters at San Francisco City Hall on Sept. 15. 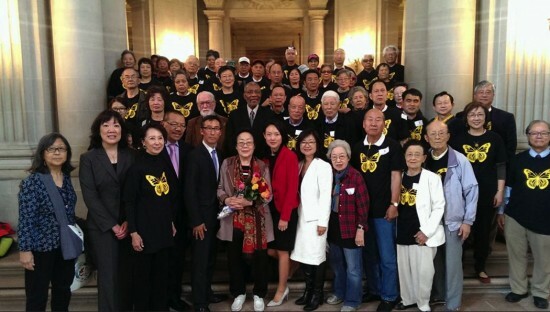 SAN FRANCISCO — Supervisor Eric Mar, who last year introduced a resolution to establish a “comfort women” memorial in San Francisco, is critical of a recently announced agreement between the Japanese and South Korean governments to resolve the issue. The resolution was approved by the Board of Supervisors in September. Those who spoke in favor of the resolution included 87-year-old Yong-Soo Lee, who came from South Korea to discuss her experiences as a 15-year-old girl forced into sexual servitude for Japanese soldiers. Speakers from Southern California included members of Korean American Forum of California and Nikkei for Civil Rights and Redress in support of the resolution and Global Alliance for Historical Truth in opposition. It has not yet been determined when or where the memorial will be erected. Possible locations include Chinatown’s Portsmouth Square, which includes a Goddess of Democracy statue dedicated to the student protesters at Tiananmen Square, and the Richmond District’s Lincoln Park, which includes a Holocaust memorial. A memorial put up in Glendale’s Central Park in 2013 depicts a young Korean girl. It is a replica of a statue that stands outside the Japanese Embassy in Seoul, where former comfort women and their supporters regularly hold demonstrations. Under the agreement, Japan will establish a fund to aid the few surviving victims, Prime Minister Shinzo Abe apologizes to the women, and the Japanese government acknowledges its responsibility for their plight. The South Korean government will make efforts to remove the Seoul statue, will not assist efforts to put up memorials in the U.S. and other countries, and will refrain from criticizing Japan over the issue in the international community. “Like the Comfort Women Justice Coalition here, the Korean American Forum in L.A. and comfort women like Halmoni/Grandma Yong-Soo Lee, I am concerned about the agreement because the voices of the women victims was not included in the negotiations,” said Mar. “How can anyone call it a ‘settlement’ when the women VICTIMS of the horrors and atrocities of the Japanese military and government were not included? “The $8 million fund is pitiful and seems to me a slap in the face of so many who suffered and the generations of shame and hardship and economic losses they endured. Opponents of the memorial include those who deny that Japan committed war crimes, those who argue that other countries have committed similar crimes but Japan is being singled out, and those who fear that it will stir up anti-Japanese sentiment.